is the third in the series of adventures featuring Disney's TinkerBell and her friends, in the time before "Tink" meets Peter Pan. I couldn't be more excited this movie as we find "Tinker" coming in contact with her first human during a summer adventure in the country. Lizzie, a lonely and fairy obsessed little girl, makes a fairy house and wistfully adds a "welcome fairy" sign hoping to attract a fairy. And she does just that, when the ever curious Tinker Bell wanders in. Tinker Bell's clever and talented friends then must set off to rescue the trapped Tink from the human. While the story is a bit "Disney predictable" - a too busy father with a precocious and fearless young daughter who is struggling to gain the eye of her preoccupied dad. This story shows that friendship can be found in the most unexpected places, and that trust, faith and love are the most important things to us all. This is the perfect movie for kids and the adults that love them! Charming, cute and fun! This gorgeously produced DVD was directed by Bradley Raymond with voices supplied by Mae Whitman, Michael Sheen, and Kristin Chenoweth. I don't know why this went straight to DVD, I sure would have taken the kids to see this in a theater! We're anxiously waiting for the next Tinker Bell adventure! 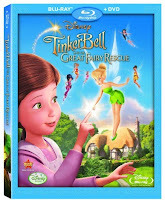 Disney's "Tinker Bell and The Great Fairy Rescue" is in stores Tuesday, September 21. Source: This DVD was provided to me by the studio at my request and in no way affected by review.